Increased resistance to harsh weather thanks to its galvanized steel construction. Robust structure with a new design which provides a greater rigidity to the set. 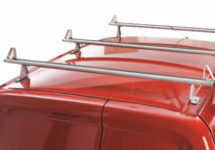 Innovative quick fitting system of the crossbars of the roof racks; these crossbars, together with the new design of the side tubes with open inner rails, improve the assembly time. Better aerodynamics thanks to the set design and the aluminium wind deflector. Improved aesthetics with regard to the previous models; this new version is in line with the current models of vehicles. It has a textured coating. The dimensions have been fully redesigned so that it can adapt better to each type of vehicle. Wide variety of specially designed accessories, suitable for the rest of Cruz steel roof racks and designed to meet the needs of professional users. Its design provides professional users with a safe system for loading and transporting materials on the roof of the vehicle.